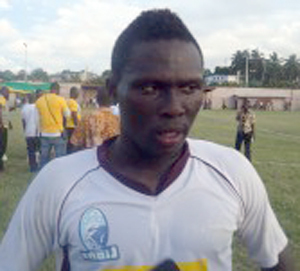 It is impossible to write about talented footballers in Ghana without sooner or later writing about the impressive Gilbert Fiamenyo – the star striker of Heart of Lions FC, currently number six in the GLO Premier League 2010-2011. The first time Fiamenyo made headlines was in the season 2007-2008, when he featured for the Red Bull Academy, based in Sogakope in the Eastern parts of Ghana. As far as I know, the Red Bull Academy did not take part in any of the three top leagues in Ghana during the season. It is unclear to me where Fiamenyo played for the 2008-2009 season. According to several sources, Fiamenyo played for Power FC from Koforidua at the second level of Ghanaian football, but I am not able to find trustworthy information confirming this. Fiamenyo played for Hearts of Oak SC during the “Top Four Cup 2009”, a pre-season tournament for the top four teams of the GLO Premier League 2008-2009. As far as I know, Fiamenyo played either as a trialist or as a loan player. Fiamenyo made a good impression and was described as a strong player but failed to get a permanent contract with the top club from Accra. Fiamenyo decided to join Heart of Lions FC instead and made a huge impression during his first season at top flight. It is not clear how many goals Fiamenyo scored in the GLO Premier League 2009-2010, but he scored at least two goals and probably one or two more. Fiamenyo was simply brilliant during the Top Four Cup 2010, scoring five goals for Heart of Lions FC during the tournament, which made his top scorer together with Edwin Osei Pele of Hearts of Oak SC. This clip shows glimpses of his brilliance during the Top Four Cup 2010. The 2010-2011 season has been somewhat of a breakthrough for Fiamenyo. He is now the lead striker at Heart of Lions FC and the big star of the team, perhaps together with goalkeeper Joseph Addo (born 02.11.1990) and midfielders Gladson Awako (born 31.12.1990) and Bright Nsiah (born 19.10.1988). In October 2010, Fiamenyo was linked to Apollon Limassol from Cyprus but this move never materialized. In December 2010, Fiamenyo was named in the squad of the Ghana B national football team, preparing for the Orange African Nations Championship 2011 (CHAN) in Sudan. Few weeks later, Fiamenyo was linked to Belgian top level club Lierse SK. Fiamenyo made the final CHAN-squad and started two of the three matches played by Ghana. Ghana lost all three matches and the tournament was basically a disaster for Ghanaian football. However, during the tournament it was reported that the Sudanese top club Al-Merreikh had noticed the burly striker Fiamenyo. Fiamenyo has scored six goals so far during the GLO Premier League 2010-2011, including three goals in the last three matches. He is the top scorer of Heart of Lions FC. According to the official Ghana team list for the Orange African Nations Championship 2011, Fiamenyo is born 06.07.1992. The same date of birth was found in the official Heart of Lions FC team list for the GLO Premier League 2009-2010. According to the Facebook-page of Fiamenyo, he is born 06.06.1992. This would actually mean that Fiamenyo was only 15 years old when he played matches for the Red Bull Academy. In January 2011, Ghanasoccernet described Fiamenyo as a 19 year old striker, which would suggest he is most likely born in 1991. According to World CV Sport, Fiamenyo is 179 centimeters. The last name of Fiamenyo is often written “Fiamenyoh”. He uses the name Fiamenyo at his Facebook-page and I assume this is the correct one. Earlier this month, it was reported that both Asante Kotoko FC and Hearts of Oak SC are working hard to include Fiamenyo in their squad for the next season. I guess Hearts of Oak SC are kicking themselves that they did not sign the talented player when they had the chance before the 2009-2010 season. The picture of Fiamenyo is taken from dailyguideghana.com.